WHAT TO BRING: All scuba equipment including regulator with pressure gauge, depth gauge, compass and octopus, buoyancy compensator with power inflator, timing device, weight belt, and wet suit. A pocket mask is also required. If you do not have one, it can be purchased at FKDC. A 10% student discount is available on equipment rentals and up to 20% on equipment purchases. WHAT TO EXPECT: The Rescue Diver Course is designed to develop the necessary knowledge and skills for individuals to perform diver rescues and assists, manage diving accident situations, render proper first aid and qualify for Divemaster training. Rescue Diver training is an important step in expanding a diver’s knowledge beyond a purely recreational level. PREPARATION: Rescue Diver candidates are required to do the PADI Rescue PADI eLearning course study prior to the start of the course. The Rescue Diver candidate should also be comfortable with their diving skills. If you are a little rusty or it has been over 6 months since your last dive we recommend that you do a pool check with an Instructor and a day or two of diving prior to your class start date. If over a year since your last dive, a pool check with an Instructor becomes a minimum requirement with emphasis on at least one boat dive prior to starting your course. COST: $425.00 (based on 2 person minimum – add $100.00 for private class). 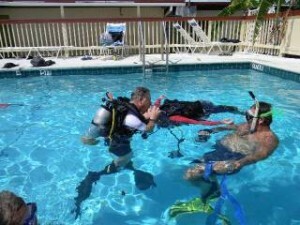 Does not include eLearning fees payable to PADI. HOW TO REGISTER: A $100.00 deposit is required two weeks prior to the course starting date. Upon receipt, we will send you your course assignments and itinerary sheet.